Grace Lutheran Church West Springfield offers its congratulations to newly elected Evangelical Lutheran Church in America (ELCA) Bishop the Rev. Elizabeth Eaton. 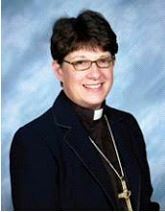 Eaton, the first female bishop of the ELCA, will replace outgoing Bishop the Rev. Mark S. Hanson. Eaton, a native of Cleveland, Ohio, was ordained in 1981 and was elected bishop of the Northeast Ohio Synod in 2006. She was elected Aug. 13 at the ELCA’s 2013 Churchwide Assembly in Pittsburgh. Bishop Eaton’s husband, the Rev. Conrad Selnick, is an Episcopal priest and a management consultant. They have two daughters, Rebeckah and Susannah. See/click below to view the video of Bishop Eaton’s historic election and reaction from New England Synod Bishop James Hazelwood. This entry was posted in News and Announcements and tagged Bishop Eaton, Bishop Hazelwood, ELCA by Eric Parizo. Bookmark the permalink.